Ben Mee remains a doubt for Sunday’s trip to face Arsenal at the Emirates Stadium. Mee has missed the last five games with a stress injury at the bottom of his shin. And while he is improving, he only has an outside chance of returning at the weekend. Scott Arfield, set to join Rangers on a free transfer in the summer, is also still out with a calf problem. Sean Dyche said: “We’re good. Ben Mee won't quite make it, but he was on the grass, that’s a sign it’s easing. ”And Scott Arfield won’t make it. Burnley are virtually assured Europa League football, six points clear of Everton as well as a goal difference 15 goals better. The game, of course, is Arsene Wenger’s last home match after 22 years in charge of Arsenal, and there will be a guard of honour for one of the Premier League greats. Dyche is a huge fan of Wenger, and he joked: “I bet he’s delighted his last game is against us, that was written in the fairytale of the story! “He’s a legend of the game. Whatever happens on Sunday there will be some special moments for him and rightly so. “It was a shame last that they couldn’t add to the fairytale that it is. Asked what he has taken from Wenger’s approach to management, he smiled: “I couldn’t believe he didn’t sign me. Having looked at their centre halves, the way I played and brought it out from the back, that’s his loss! “There’s many things down the years, the biggest thing for me is how to develop a side for the next challenge. “His first side he inherited a different way of playing, a different format and style, and he slowly changed that over the years, with his own thinking and recruitment. “He stayed current. That’s not an easy thing to do. There’s a lot of good things you can rely on as a manager and there’s certain things I rely on myself still after seven or eight years, there’s certain things I think are non negotiable and they’re the fundamentals of what we try and put into a team. 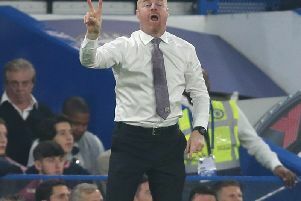 And with a first European campaign in 51 years to look forward to, Dyche added: “Breaking new ground here has become a theme of the different successes we’ve had over the last few years, different historical markers. But that comes with the good work the players have done.he players deserve an enormous amount of credit, for this season and every other season I’ve been here. “There hasn’t been a season when I haven’t take pride in what the players have attempted to do, even in the season when it didn’t work out for us, they gave their lot.